Roisin Toole (née Carney) was evacuated to Kettering at the beginning of the Second World War with St. Aloysius’ Convent School. We are grateful to her for her account of life experienced as an evacuee attached to our parish. As we walked in a school crocodile up Station Road on Saturday, September 2nd 1939 I don’t suppose any of us imagined that Kettering was to be our home for the next six years. Practically the whole of St. Aloysius’ Convent School was in the crocodile, shepherded along by our teachers and nuns and, at this time, I knew none of them except my younger brother who had been allowed to come with me. I was eleven years old and was commencing secondary education at St. Aloysius’ which was normally based near Euston Station in London. It drew pupils from many parts of London and I came from Finchley – about an hour’s journey to the north. We had been told that the school would be evacuated if the likelihood of war increased, so for the past week we had been travelling to the school each day carrying a suitcase, gas-mask and packed lunch, returning home each night. It was an anxious time for all and we were no doubt apprehensive. However, some schools had already gone from the Euston area and our turn came on Saturday, September 2nd. We walked in a crocodile along to St. Pancras Station, boarded a train and arrived in the afternoon at Kettering. What I remember of the walk up to the hall at the top of Station Road was that the lamp-posts were prettily adorned with baskets of flowers – they were not like that in Finchley! It must have been a mammoth task for the officials concerned to get us all into manageable groups, as we were not the only school in the hall at that time, but eventually we were allotted to billeting officers and given a few provisions to take with us. Our billeting officer got us into some sort of order and wrote our names in his notebook and off our group went to St. Peter’s Avenue. We were of all ages and some with younger brothers and sisters and it would have been better, I think, had they taken us class by class, as then we would eventually have had friends nearby, but they hadn’t thought of that and we ended up spread all over the town. We progressed down St. Peters Avenue dwindling in number as the good ladies of the houses came out and chose from among us, little suspecting, I am sure, that they might be having us live with them for six years. There was difficulty placing those of us with brothers as not many households had two bedrooms to spare, but eventually next-door neighbours agreed that one would have the girls and the other the little boys, so I ended up with a 15-year-old girl and our two brothers were next door. The next morning we all met up again at St. Edward’s for Mass. In those days the church was being built and all the services were being held in the hall next door, which was not dissimilar from our church in Finchley which, incidentally, was completely demolished by a direct hit in the bombing a couple of years later. After Mass we had a school photo taken and were then introduced to Wicksteed Park which was huge and wonderful with its swings, slides, lake, zoo and pretty gardens. When we got back to our billets we were told that we were at war with Germany but that it probably would not last long; (the poor people must have devoutly hoped that it would not!). During this first year most of us were homesick and very unsettled as some householders had been pressurized into taking us, having been told that the alternative was to have soldiers. Some were elderly and found the extra work too much, so some of us were moved a few times. I and my girl housemate had three billets in nine months and then she and our two young brothers went back home probably because the bombing of London had not yet started. 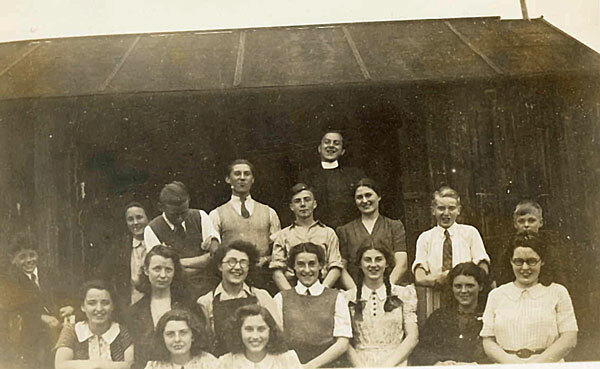 School was also a bit chaotic as we shared school premises with the Rockingham Road Girls’ School – mornings one week, afternoons the next, which could not have been easy for either school, but they put up with the sudden invasion graciously and we continued to use their specialist facilities throughout our stay, although we obtained permission to use the Wesleyan Chapel complex on the other side of the road as classrooms after a while and thereafter had a normal school timetable. However, early on we had a lot of spare time and, not being in our own homes, we spent a lot of time mooching in and around Kettering. It was a very cold winter and snow was piled up on walkways seemingly for months. I remember my friend Vicky and I going for a country walk and taking off our shoes and socks to walk barefoot across fields which had flooded and frozen, and being helpless with laughter as our feet sank through the ice. It seems to me that the area around Kettering often flooded and I think it was because it contained quite a few rivers. Another of our pastimes was to write messages to our mothers on tiny scraps of paper and go to the railway bridge near the end of the Headlands and wait for a London train to pass under and try to drop the message on to it, thinking of it getting to home even if we could not. The bridge is now a lot higher than it was in those days and there was open country beyond which we often went for walks. At this time church and school were the stable elements in our lives and we were very fond of both. We attended as many church services as we could and became very close to our teachers and fellow-pupils. Ours was not the only school evacuated to Kettering – two Catholic primary schools had arrived the day before – St. Dominic’s, which my younger brother attended, and another convent school run by the Sisters of Providence of the Immaculate Conception. Both of these schools came from Hampstead, I think. Dame Alice Owen’s School for Girls and Clark’s (Secretarial) College were also there, but I think only stayed about a year. A neighbour of mine, two years older, was with Clark’s and remembers Kettering well – she was billeted in Windmill Avenue. When we first arrived the parish priest of St. Edward’s was Father (later Canon) Hunting and the curate was Father Macklin. Both were very welcoming to this sudden influx of children into the parish, despite the fact that we couldn’t have swelled the coffers overmuch with our weekly pennies. There were also two extra convents of nuns to accommodate in addition to the Ursuline Convent already established in Kettering. Our nuns, (the Faithful Companions of Jesus) lived in a house in the road leading from Station Road to the Headlands, and the Sisters of Providence were also in a house there. Our lay staff had a house in the Headlands and I think most of them stayed there throughout the war. Morning Mass was very early as some people commuted to London afterwards and our nuns and the Sisters of Providence attended that Mass, while the curate went up to the Ursuline Convent as usual. Our nuns were always very thankful when a visiting priest was available to say Mass in their house-chapel and they were spared the walk in all weathers up to St. Edward’s! 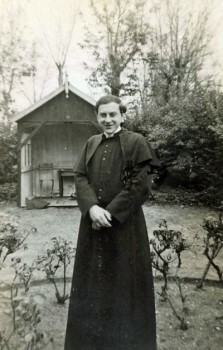 Not very long after the war started Father Macklin was moved in a diocesan reshuffle and Father Kevin Jones came as curate, and, like us, was destined to be there throughout the war. He and Father Hunting were a revelation to me because our P.P. at home in London was elderly, Irish and rather intimidating. 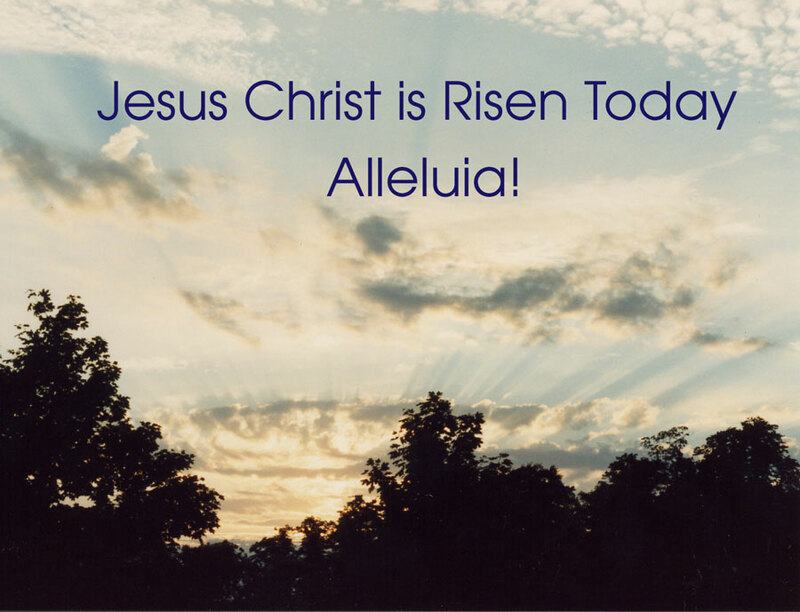 He was given to appearing in school on Monday mornings and firing Catechism questions at us and he gave out bunches of shamrock on St. Patrick’s Day which we did not know what to do with for the rest of the day. I was under the impression that the shamrock was extremely holy and handled it reverently. Father Hunting and Father Jones seemed to know all their parishioners and were friendly and approachable and there was always a happy atmosphere in St. Edward’s. In the Spring of 1940 I moved into my third billet and was soon joined by three other girls from my school and their brother. It was not a happy placement for us. The lady of the house was not a native of Kettering but came from a Lancashire cotton town. She was always telling us how privileged we were compared with the children of her town. Perhaps we were but we never had enough to eat, all had to share the same bath (one after the other – once a week), and all had to be in bed at 7.30pm despite the fact that one girl was 15 and her brother was 13. The three sisters shared a bed in the same room as their brother and I had a chair-bed with wooden slats covered only by a blanket. When the children’s mother came up on a visit, she was appalled and took her family home and our headmistress said I must be moved. There were two good things about that billet: one was that Father Jones used to visit because the lady was a lapsed Catholic, and the other was that I was allowed to go to morning Mass which I had not been allowed to do before his visits. She made stipulations – she would not call me and, if I was late back for breakfast, I would miss it. (It was so meagre that I don’t think I would have missed it that much!). However, the unhappy man of the house had to leave for work in Corby at 6 am and I was always awake, so I used to get up then. Sometimes I felt faint at Mass and then Agnes (Agga) Langley would kindly walk most of the way home with me, which was how I first met the Langley family. One of the great blessings of my life was bestowed on me a little later when Mr. (George) and Mrs. (Gerts) Langley asked if I would like to come and live with them. They had a large happy family and the eldest son was already a diocesan priest and eventually two daughters became Franciscan Missionaries of Mary. When I went to live there, five of the children were still at home although the eldest daughter, Josephine, was shortly leaving for the convent. 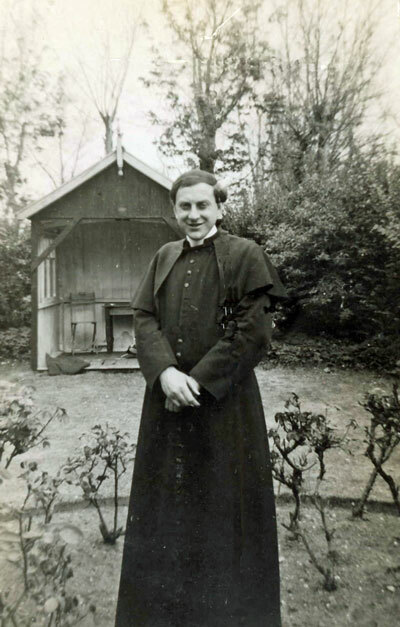 The Langley family had lived in Kettering for many years and was very much involved in parish activities – running the repository, the Guides and Cubs and putting on a play for the parish the first two or three years I was with them. They lived near the church and, being very hospitable, entertained visitors sent along to them from the Presbytery. They later took in two other girls from our school so we were quite a big household and we evacuees were happily settled at last. The lovely new St. Edward’s Church was completed in 1940 and the hall was available for parish activities when not being used as a school. Bishop Parker obviously found good use for the business skills of Father Hunting and he was therefore over in Northampton some days of the week, so a lot of parish work devolved on Father Jones. He was an amazing priest really and I should think had a lasting influence on all the parishioners. Realizing that there were a lot of school-children away from their homes and with time to spare, and that there were also a considerable number of families whose men folk were in the forces or relocated to other areas, he set about finding ways to help both. He did a lot of parish visiting, got to know peoples’ situations, and also set up a boys’ club and a girls’ club. The boys were mainly local boys and met on one evening a week in the hall. Somehow Father Jones managed to procure brass-band instruments for them and someone to teach them – they also had table tennis, refreshments and a discussion group with Father Jones. On Saturday afternoons the girls had their club with the hall divided into three sections – tea, biscuits and cakes served in the first which also housed the table tennis as for the boys – dancing and general socializing in the second – a discussion group in the third, or listening to music when the record player was not wanted for dancing. 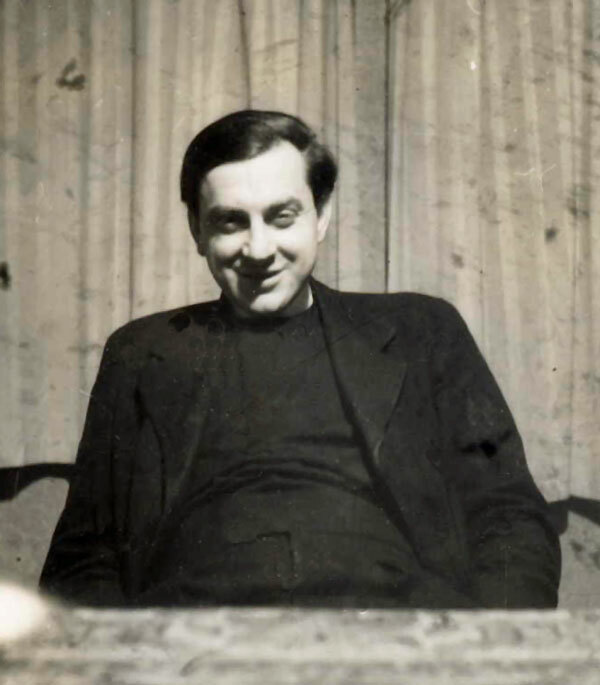 Father Jones would come and go as duties allowed and in this way he got to know the young people of the parish and also could impart to us some of his ideals and enthusiasms. We had very many interesting discussions on all sorts of topics and he broadened our minds a lot. The clubs were very popular – a meeting-place where we could socialize and Father Jones occasionally took us on outings – among which we went to Stamford, St. Ives, Northampton Cathedral and once to an orchestral concert in Leicester – my first ever – and I asked him what they were playing and was rather embarrassed when told that “They’re only tuning up!”. Later he hired a tennis court with a little club-house on it so we had facilities for playing tennis – something we did not have at school and the boys enjoyed that too. I don’t know who paid for these things – Father Jones or the parish? – I only know that it all made a big difference to the lives of many of us. 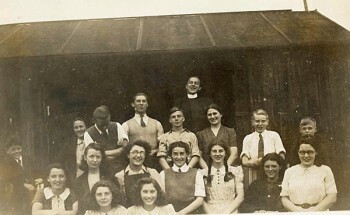 We were also very glad that we could be of some use to Father Jones and some parishioners because he knew he had a large pool of willing helpers he could deploy in various ways to help, such as clearing the hall after school finished on Fridays in preparation for the weekend activities; this meant moving the desks into the small annexe and piling them up on top of each other – also sweeping the hall and setting it up for the youth clubs or parish meetings. Sometimes there would be a special parish event such as the talks on their countries given by foreign embassy staff which Father Jones had arranged and for which we all made an extra effort, decorating the hall with home-made flags and sometimes posters with foreign inscriptions complimentary to the country concerned. Even the chairs got a special dusting on these occasions and I remember Father reminding us that “Chairs do have legs, you know”. As well as hall activities, we had tasks which included looking after toddlers while their mothers tended babies or sick children, doing necessary jobs such as shopping, walking dogs or taking messages for housebound people, visiting older people in a home and occasionally taking one such, a very sweet old lady, out in a wheel-chair for a cup of tea and a bun in a local tea-room. We also shopped for the clubs’ refreshments and laid them out ready and were available for running messages in those days when few people had telephones. It did not amount to a great deal really as we had plenty of time and really enjoyed being a bit useful. We did these things with a friend and learned by experience, sometimes bitter experience, how to get a pushchair down a kerb without tipping the toddler out and having to take him home crying. The boys did more manly tasks like mowing lawns and weeding gardens and mending things for people, and were most useful when there were heavy things to do and carry – strangely they never seemed to be around when we were moving those desks! Sometimes Father Jones’ arrangements rather ran counter to those of our headmistress, Mother Catherine. 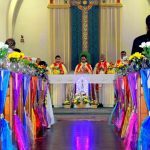 On one occasion he had managed to acquire enough paint to redecorate the hall and planned that a few of the boys and girls should do this on the forthcoming Holyday of Obligation. We did tell him that Mother Catherine was planning a school outing to Althorp on that day and he said he was sure she would not mind a few of us missing it. Unfortunately neither he nor we informed her of this plan and she came to the hall in search of us. Well, I don’t think any of us had ever wielded a paint-brush before, and we certainly hadn’t mastered the technique by the time she appeared at the door. Father Jones had borrowed some decorators’ coats for us and my friend Vicky and I were high up on the same ladder, she with the brush, and I below her, holding the can of paint. We were rather nervous, holding on to the ladder with one hand, and Vicky was doing her best with the wall, but dripping paint liberally on both of us, when Father Jones, who was overseeing all the efforts going on around the hall, arrived at our area and told us to “Stop larking about up there!” Since we hadn’t been ‘larking about’ but rather hanging on for dear life, this struck us as rather funny and the sudden appearance of Mother Catherine at the door and her dismay at our appearance (daubed as we were with pinkish paint) did nothing to help an attack of giggles. After a few soothing words from Father Jones and apologies from us, she recognised defeat and returned with good grace to the coach. So we missed one of the only two school outings that happened while we were in Kettering, but the combined clubs did get the walls finished that day and Father Jones was as pleased as we were with our efforts, which was gratifying, as he could be quite exacting. How to paint walls was one of the least important things we learned from him and I think he must have had a lasting influence on the whole parish. Adults willingly did tasks required of them by either priest – Mrs. Langley and another parishioner started a Cub pack, becoming Akela and Bagheera, Agnes (Agga) started a Girl Guide Company which many of us joined and this also was an activity we much enjoyed. She was suddenly promoted to Captain although she had never been a Guide before, and we learned as we went along how to pass all the tests and even to march well enough to take part in a special parade in Wicksteed Park in honour of some local dignitary. The marching with flags hoisted, I must admit, was only possible with training by a rather bemused Group Commissioner who spent some hours with us explaining how to do it properly – in two’s, then four’s and eights – but we got there in the end. I know many of the parishioners helped willingly when asked to by the priests and Mrs. Langley fostered babies on a few occasions when their mothers were ill and I am sure many others were helping in similar ways. There was a very happy atmosphere in the parish and I think this was in large part due to the fact that Fathers Hunting and Jones worked so well together – both were hard-working and Father Hunting ran the parish very efficiently as well as helping the Bishop. St. Edward’s had a very full and inspiring Liturgy ( for special times such as the Corpus Christi procession and the Holy Week services the Dominicans from Laxton came to help and it was all very beautifully done). He allowed Father Jones scope to work with the youth groups and see to other parish concerns – both priests were very much liked and appreciated. By 1942 it must have seemed to the people of Kettering that a period of comparative calm had returned to the town – some of the evacuees had returned whence they came and those remaining had been satisfactorily accommodated. 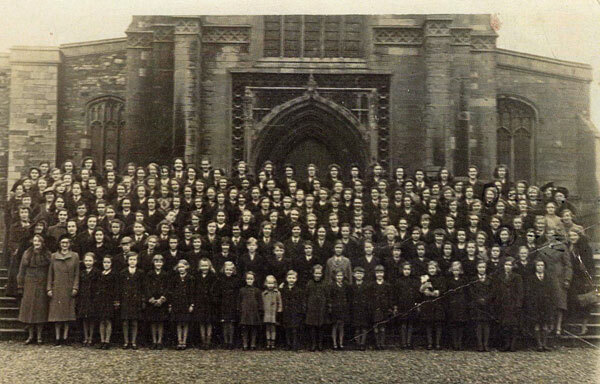 Our school was joined by a sister convent school which had been bombed out of Bath, but quite a number of their girls and some of ours had returned to London so the extra impact on the parish was probably not great. The arrival of the American 8th Air Force in 1942 changed all that – bases were built within easy reach of the town and depots inside it and before long their servicemen and vehicles were a familiar sight on the streets, and cinemas and pubs were crowded, especially in the evenings and on weekends. Soon, as we walked to school in the early mornings, we would see their B17s (Flying Fortresses) assembling into formation overhead and going off on bombing missions over Europe. The airman did not usually attend services at St. Edward’s because they had their own chaplains and chapels on their bases, but their chaplains used to call in at the presbytery to get supplies of essentials such as altar breads and wine, and our priests introduced them to families in the parish who were happy to welcome them and the men they brought in with them into their homes. Everyone was aware that the Americans had come to help Britain at a time when the war was not going too well – our shipping losses were great, our cities were being bombed and our resources were badly stretched. The necessary invasion of Europe by our forces (the Second Front) must have seemed a daunting prospect. The effect the arrival of the Americans had on our lives was immense – they were so fresh to the war, so optimistic and full of fun – somehow we felt that everything would be all right, but there was a long way to go before that. The chaplains used to bring some of their men in to visit the many families who, like the Langleys, were ready and generous hosts to them. Some of the men were little more than boys, some were married with children of their own – they probably liked to enjoy an evening with a family, sharing a meal, playing games, having a sing-song round the piano or going in a group to the cinema. We found them very different and exciting and they were also very generous guests, bringing in foods which were real luxuries in war-time Britain and of course plenty of chewing-gum! Their chaplains used to arrange to take groups in army trucks back to their bases and, on one occasion they took St. Edward’s combined Youth Clubs with Father Jones to Thurleigh base and showed us the huge B17s and their chapel and gave us a lovely tea. They also arranged Christmas parties for the local schools, including ours, with Father Christmas arriving in a jeep on to the dance floor at the George Hotel! Sadly the 8th Army Air Force suffered tremendous losses on the daylight bombing raids over Europe and, although at the time I know I was not aware how great these were, now, looking back, I think of how brave those men were, going out on dangerous missions by day, from which some of their crews had perhaps not returned, then coming into Kettering, trying not to think of tomorrow by relaxing with a family such as they might have left in the States. Usually they had to complete 25 missions before returning home. Although the Americans did not attend St. Edward’s often, we did have quite a few other servicemen at times – I remember Canadian Air Force servicemen, Polish and Belgian airmen who were in the R.A.F. and Czech soldiers who were also guests of the parishioners. No doubt due to the language difficulty, Father Jones thought one group of Czechs were Christian Brothers and invited them to tea at the Girls’ Club. However it soon became apparent that they were interested in pairing off with some of the girls and we didn’t seem to have them to tea anymore! Later in the war there were German and Italian prisoners of war coming to Mass on Sundays. The Germans always came in a troop with a British officer in charge but the Italians seemed to amble in on their own, dressed in brown dungarees. I remember Father Hunting and Father Jones speaking to them after Church. In May 1945 the war ended and the Americans started to return home and it was obvious that our school would soon be returning to London, but we did not go until the end of the school year. In a Diocesan reshuffle Father Grant was to be the new P.P., Canon Hunting went to administer a boys’ home (I think) and Father Jones went as P.P. to Cromer in Norfolk. Before they left Father Jones arranged a formal farewell dinner for his Youth Clubs in the hall. We all had to acquire some form of evening dress – mostly borrowed – and we adorned the hall festively for the last time with lights and paper decorations. We borrowed table-cloths, china and cutlery, and the tables looked elegant with candles and flowers. All through that scorchingly hot Saturday in June we all worked so hard, the boys in the hall seeing to the tables and the chairs (with legs!) and we girls in the presbytery preparing the food kindly provided by our long-suffering billetors and the ladies of the parish who helped cook it. It was an evening to remember, with Canon Hunting and Father Jones looking resplendent in their very best canonicals and gracious speeches being made by them and replied to by club members. Very soon afterwards, at the end of term, we left St. Edward’s and Kettering and all our kind hosts, and returned to our own homes and parishes. Poor, war-weary, dirty, austerity London with its extensive bomb-damage and brave citizens who had endured so much and now had to cope with even greater shortages of almost everything (because American help had to be diverted to the greater need of Europe), was a different world from the one we had been used to in Kettering and for some of us it was hard to adjust. We are old now and dwindling in number, but the school-friends with whom I have kept in touch remember with great affection St. Edward’s – its priests and parishioners – and the good people of Kettering who harboured us so generously and, even after the war, made us welcome when we returned on visits. The Langley family lived on there until very recent years when Agga went to Nazareth House in Northampton and was active there until she died. There is to be a memorial plaque to the family placed in the baptistry later this year and at least three of the original family and three former evacuees hope to be there for the ceremony, I among them, God willing.